Over the years of reading about home decorating, interior design, and browsing through thousands of home photos on Pinterest, there have been many color palettes that I have been drawn to. Pink and mustard, baby blue and coral, black and white with splashes of green, you name it. The one thing they have all had in common is that they built the color palette around one colorful item in the room. Whether it’s a bohemian rug with pink and blue medallions or an oil painting of a city scene with red and yellow buildings, you can take the colors from a piece that already has all of them represented to make it feel cohesive. In order to explain this process, I’m going to create two very different rooms with inspiration pieces. Read along to see how I take one colorful item and design a room around it! Whenever I work with a friend to help them start decorating a space, I ask them if they have any artwork or a keepsake item that they love and would like to use in the space. For one friend, she fell in love with a rug that had hues of blue, pink, and yellow. Using the rug as inspiration, we were able to build the rest of the room around it bringing in a blue side chair, yellow pillows, and hints of pink with flowers, candles, etc. Though it is alright to choose an item just for the color palette, it is important to like the item since it will need to take center stage as the binding that keeps the color palette together. Once you have chosen that bold piece, it’s time to bring it some neutral items that will coordinate with, but not overpower, it. I like to stick to neutral colors like black, white, gray and beige, or natural materials like wood and glass, on larger items like sofas, tables, and beds since these are more expensive pieces that you won’t want to replace often. Once the basics are set, it’s time to add more color! Feel free to go bold with accessory textiles like on throw pillows, blankets, curtains, and rugs. These items are all simple to change out without spending a large amount of money. You can also add color with accessories such as artwork, lamps, and vases. 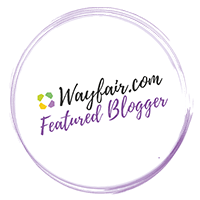 For scenario #1, Laura has chosen a colorful floral reading chair featuring hues of pink, green, and yellow-orange over a cream background to place in her bedroom. For our first scenario, I have paired Laura’s bright chair with a simple, cream bed. I have then chosen two wooden side tables to coordinate with the wood on the chair legs, and a wooden dresser to match. Usually when it comes to bedrooms, there is nothing I hate more than a matchy-matchy bedroom set. In this case with an upholstered bed, it’s easy to avoid this since you will not be buying an upholstered side table, but in general don’t be afraid to get creative! If we had chosen a wooden bed, we could have paired it with glass topped side tables. It’s great to include different materials and textures such as wood, glass, metal, and fabric to make it appear that the pieces were collected over time. With Laura’s chair, there is an important lesson to learn in color inspiration. In some cases your inspiration piece may only have one shade of pink, orange, or green, but in this case we can see a light pink and a bright one. For our color additions to the room, it is obvious that we could choose to use bright pink or light pink to match the chair, but this is actually the case even if those shades aren’t apparent. The important thing to remember is to stick with the same family of colors only ranging in lightness and darkness. For instance, I would not pair a pale salmon pink with a magenta since the salmon has an orange tint to it and does not match. But a light magenta would coordinate with a dark magenta. For this scenario, I started by bringing in pink curtains to make it the main featured color. Adding orange throw pillows to the bed, and a fun, orange vase with some character to the top of the dresser brings in that second color. Though green is a prominent color in the chair, I tend to find that green is best incorporated in a natural, living item. Whether it’s a vase of fresh flowers or a palm plant, any room looks bare without a little greenery. For a little more color that tied the scheme together, I found a pair of really fun prints to go over the bed. In order to not overwhelm the space and keep the bedroom calming, a white bed spread and white lamps finish off the look. 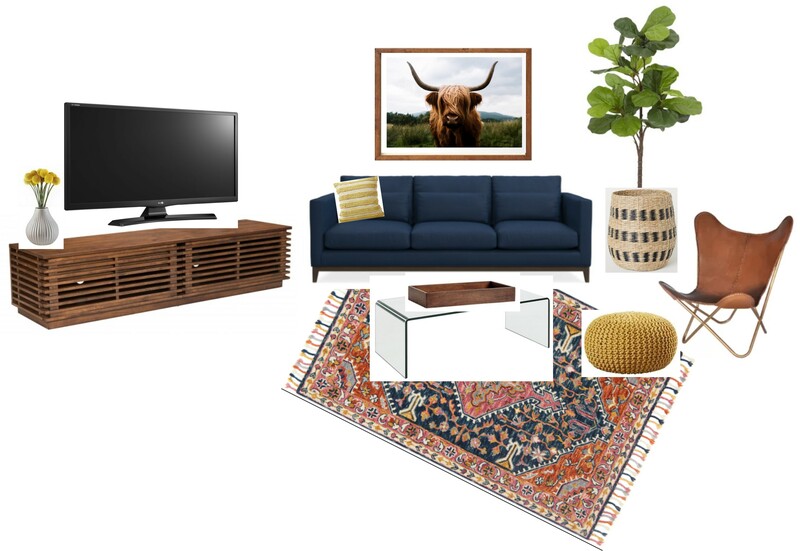 For scenario #2, James would like to feature an heirloom, bohemian rug with a navy, peach, and mustard color scheme in his living space. 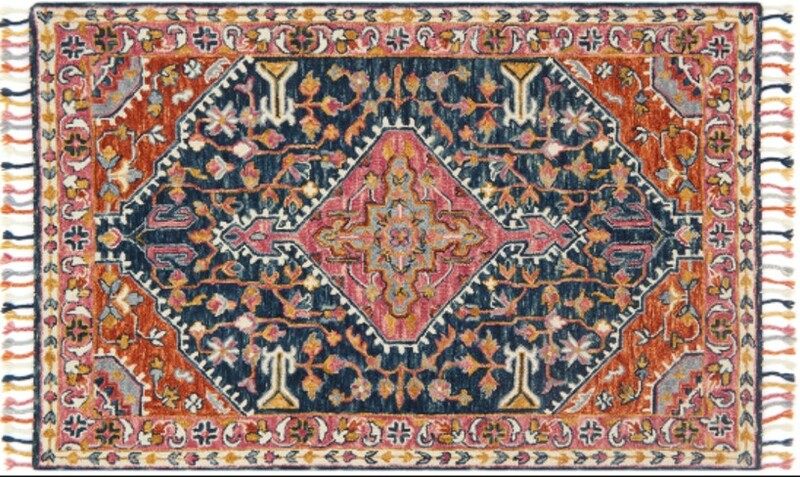 For scenario #2, James’ rug, though colorful and bohemian, has the opportunity to jive with many styles. I love mixing clean, modern lines with old, eclectic textiles to give a space a lived-in feel. 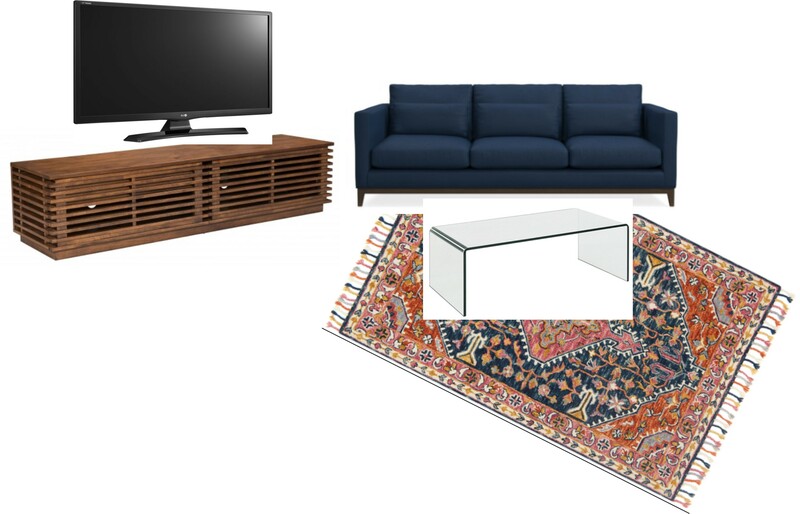 Here I’ve paired the rug with a navy sofa, glass coffee table, and wooden TV stand that allow the rug to add character to the generally colder pieces of furniture. Note that I brought in a navy sofa to this space which is a huge piece of furniture to commit to. In my mind, navy is still a neutral since it can be used in so many color palettes, but gray could have also been a solid choice. Since so much navy was brought into the room in the sofa, the main colors I played with from the rug were the orange and mustard. Orange tends to come out with leather and warm wood tones, so I brought in a leather butterfly chair, a wooden tray table, and a yak painting that also featured a little navy. The mustard was featured in the foot stool pouf, a throw pillow, and some flowers next to the TV. (Placing items around the TV is a great way to make it less of an eye sore and help incorporate it into the decor.) Again, I brought some life into the room with a fiddle leaf fig in a wicker basket. Though the colors in this room may not read as bright as the last room, the use of varying textures helps to create interest and variation. No matter how colorful or neutral you wish to make a space, you can take these basic design principles to create a cohesive room. Start with your inspiration, add in the basics, and accessorize, all focusing on color, texture, and functionality.